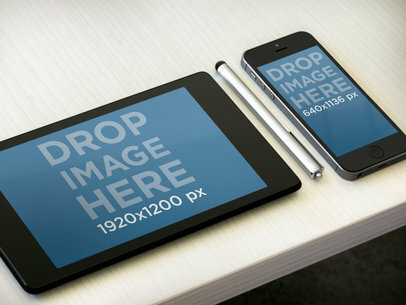 This mockup template features three different devices in one stage. It’s perfect for showing a multi-platform application. In the screen we have a macbook, iPhone and iPad all standing upright on a white backdrop. Get the new iPad App Store Screenshots here! 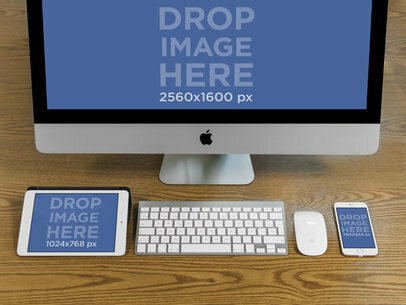 Catch your viewers attention right away by using this multi-device mockup from Placeit. This mockup features a young female student at a library using an iPhone 6 and an iPad to do some research for a school project. Make this great image part of your visual marketing campaign and advertise your business ideas, new iOS app or website within the devices displayed on the template. 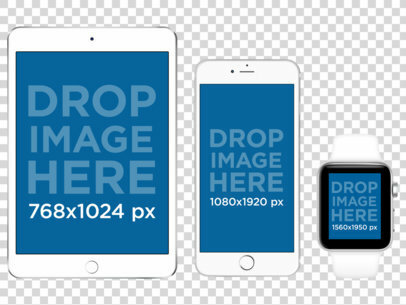 To customize this eye-catching mockup all that's necessary for you to do is choose an image, upload it onto the template and let Placeit resize it for you. Say goodbye to your outdated marketing tools and make Placeit's mockups your new marketing key asset now! See more iPad Mockups here! Set your website mockup on an iPad sitting in its keyboard deck with an iPhone 5s gray nearby. The iPhone 5s will hold an image of 640x1136px and the iPad will will hold an image of 1024x768px. Both are sitting on a wooden desk with a notepad an pen nearby. You get the perfect stage for a side by side view of your app and website. 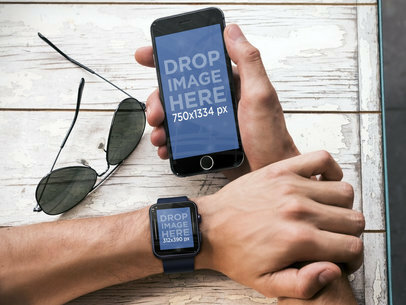 Give your app a brand new advertisement piece with this incredibly realistic iPhone mockup template. Try it out by adding an image of your choice over the placeholder, our generator will have your mockup ready in no time! Stop wasting time on Photoshop, all you need is this mockup tool and all of Placeit's customizable photo mockups, what are you waiting for? Try one out! If you’re searching for a fun, hip multi device marketing template to show off your new iOS app or website, then this Placeit MacBook Pro & Sony Vaio Laptop template is for you. 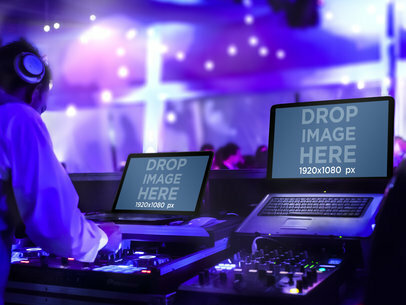 A dazzling party scene plays out here as your potential customers get the DJ’s view of the action. Here we have a behind the scenes glimpse of how the person who makes the party a memorable hit really pulls it off; with the help of your website or app of course! Two screens in landscape position on a purple lighted backdrop showcase your app or website. 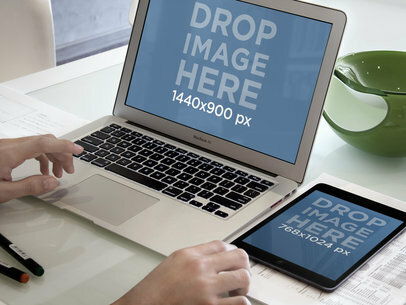 Choose Placeit marketing tools and make a custom mockup fast of this MacBook Pro & Sony Vaio Laptop template. 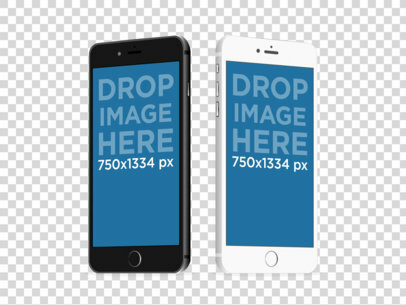 Just drag and drop a screenshot of your app or website directly onto the screens or click on the "Grab Screenshot From URL" button above the photo and type in the URL as prompted. Placeit will perform the dimensional alterations for you, and watch how this scene instantly comes life. 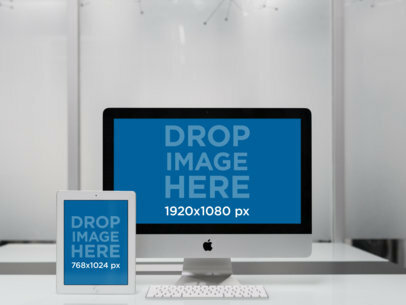 Check out this responsive mockup of an iMac and iPad Mini in portrait position. You can use this mockup to showcase your new app work in a more attractive way. 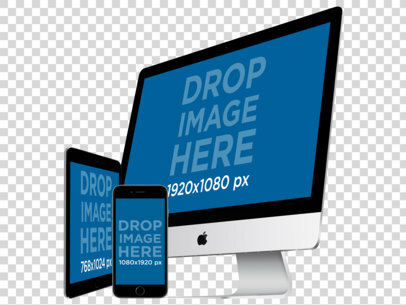 Try it out by simply placing your images over the mockup template and let our generator take care of everything for you. Why struggle on Photoshop when you can have hundreds of customizable high-quality mockups? Take your app marketing to the next level and create realistic mockups with Placeit's easy to use mockup generator! 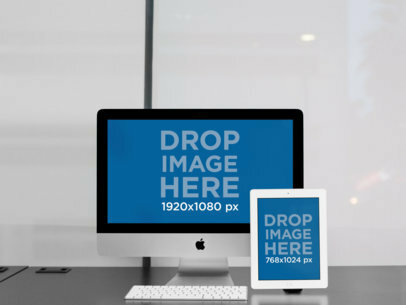 You can use this mockup template featuring an iMac and an iPad Pro in portrait position and an office desk to display your recent app work. Responsive mockups are the best way to showcase your app's best features in a more attractive manner! A Macbook Air and an iPad mini, side to side. A person crunches numbers while working on your app or website, which you can display in both desktop and mobile mode with this dual stage. It is both a Macbook Air mockup and an iPad mini mockup. 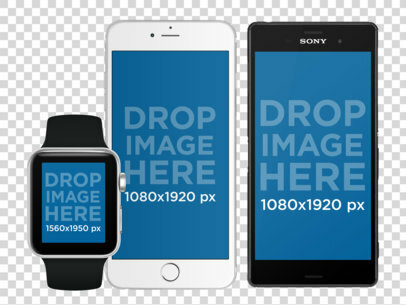 Choose digital mockups to pitch your next app and see the results instantly! Create your own responsive mockup now by adding your content over the placeholders, our mockup tool will adjust it for you and have a download ready in no time! 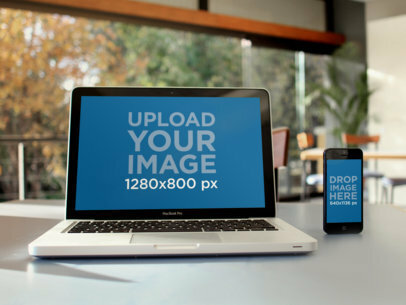 It's very easy to market your app when you have this incredible mockup generator at your side. Give your app the advertising it needs with photorealistic digital mockups curated by Placeit. 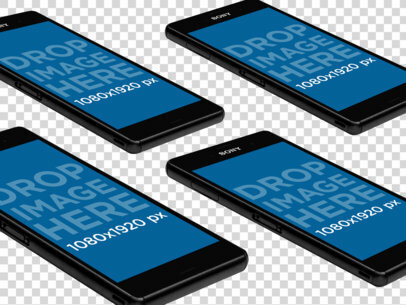 Go ahead and drop your images over the placeholders and you'll have a final asset ready in no time! See it for yourself now, and start saving time and money from your app marketing strategy. 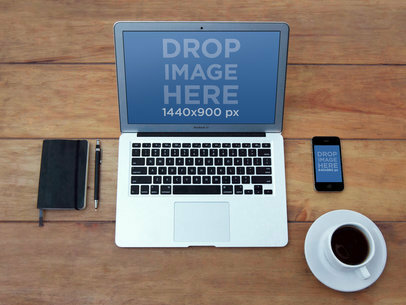 You can create all the mockups you need thanks to Placeit's mockup generator. 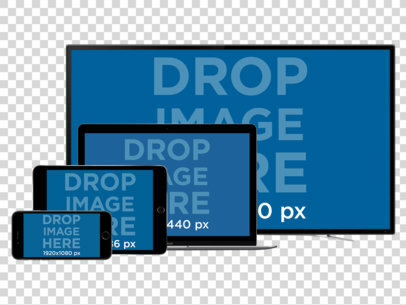 Imagine how awesome your app will look in this multiple device mockup featuring a TV, Macbook Pro, iPad Mini and an iPhone in landscape position over a PNG background. 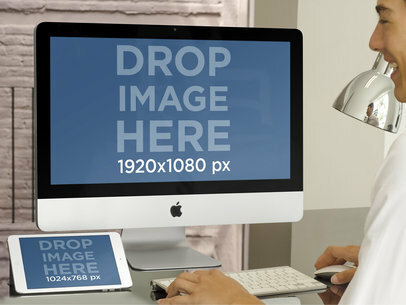 Go ahead and drop your image onto the screens and let our mockup tool do the rest, it's very easy! Do app marketing the right way and showcase your app like never before. 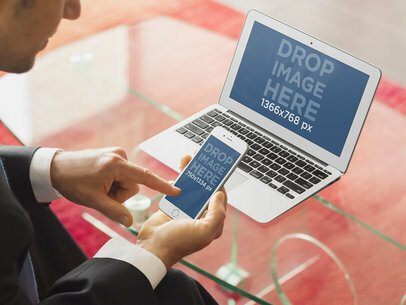 Stop looking for the same old stock photos and try digital mockup for a change! You can customize this incredible iOS device set mockup to display your app in a more realistic way. 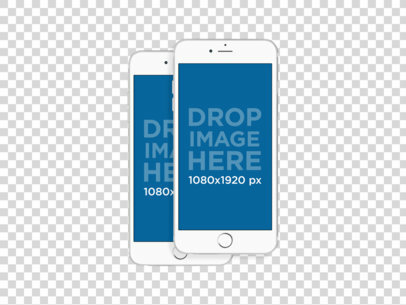 Try it now by simply dragging and dropping your image over the placeholder and our mockup generator will take care of the rest for you. 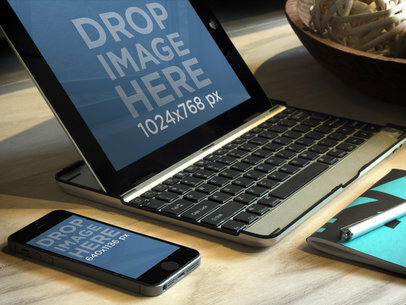 Create more digital mockups with Placeit's great collection of multiple device mockups. Is your app ready to showcase? 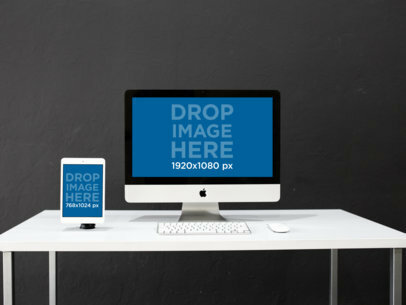 Try this new iMac responsive mockup over a transparent background and see your app come to life. 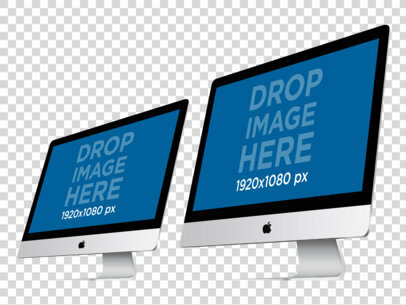 You can display your web apps on this incredible photo mockup of Apple desktop computers by simply adding your image onto the placeholders, you will get a download ready in no time! 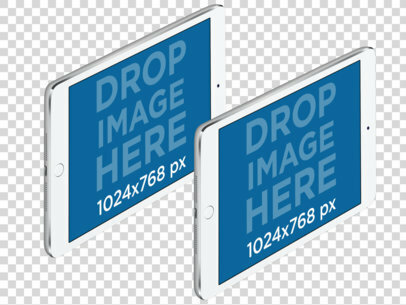 Capture your client's attention at a glance with this photorealistic mockup of two iPads in angled portrait position over a PNG mockup. Create more digital mockups in just a few seconds thanks to our easy to use mockup tool, you'll be saving money and time before you know it! See for yourself now and start customizing your own photo mockups! 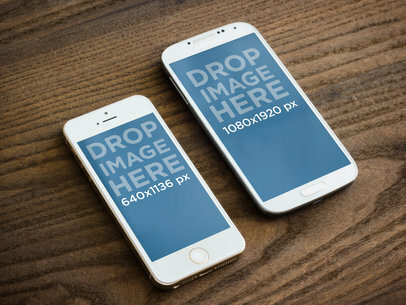 Take a look at this responsive mockup of two iPhone angled side by side in portrait position over a PNG background. 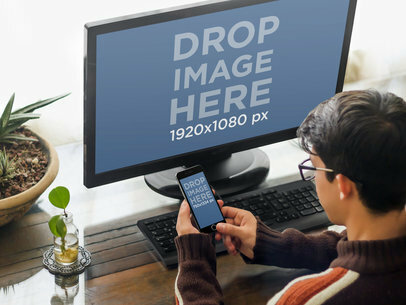 Create your own digital mockup now by simply adding your image over the mockup template and our mockup tool will start adjusting everything for you, easy right? You can build your own app marketing campaign in no time thanks to photorealistic mockups! 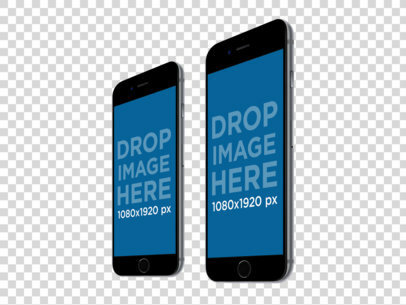 This mockup featuring two black iPhones in angled portrait position can be customized with your app's content in no time with our easy to use mockup generator! 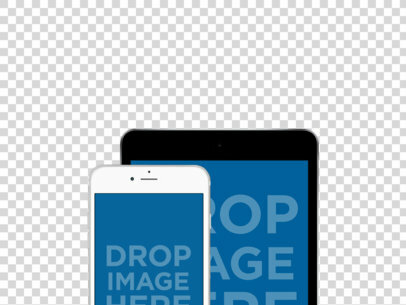 Simple drag and drop an image of your iOS app over the template and a download will be ready in just a few seconds. Make a big impression by using photorealistic mockups to create your own branding campaigns! Are your ready to put your app into action? 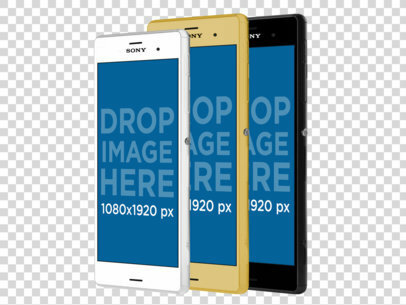 Try this mockup template of three Sony Xperia phones lined up in angled portrait position to display your latest app in a more realistic way! Simply add your image over the placeholders and our mockup generator will customize your own mockup in a matter of seconds, pretty cool right? 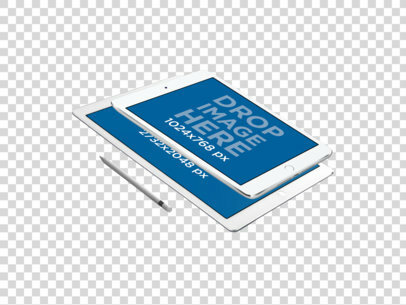 Try out your latest iOS app on this incredible digital responsive mockup featuring an iPad mini and iPad Pro floating on top of the other over a transparent background complete with an Apple Pencil. Customize it now by adding one of your app's images and see the final asset in just a few seconds. Our mockup generator is the perfect app marketing too for your next launch! Take a look at this awesome iPad mini mockup featuring two white iPads in landscape angled position over a transparent background, cool shot right? Simply add your content over the placeholders and let out mockup generator do the rest for you. You can build your own app marketing campaign with less money and time by using this great mockup tool! 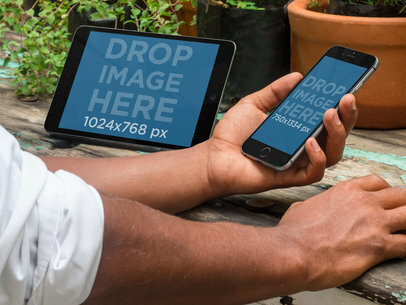 Try out your latest iOS app on this cool iPad mockup featuring two iPad Minis in landscape and portrait position over a transparent background. Go ahead and customize the screen by adding your content over the placeholders and let Placeit take care of the rest. Your digital mockups will look better than ever and so will your new app! Take your app promotion to the next level and use this digital mockup to display your app design in a realistic way! 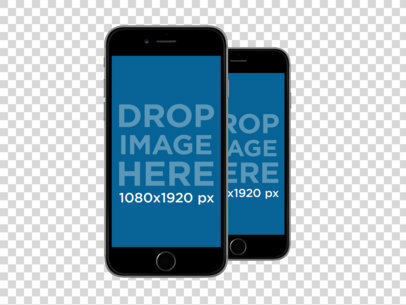 Create all of the mockups you need to make your app stand out from the rest, all you need to do is place your image over this mockup template featuring two iPhone in angled vertical position over a PNG background. Check out this cool iOS device set mockup featuring a Macbook, iPhone 6 Plus and iPhone 6 in portrait and landscape position over a transparent background. This mockup is perfect to display your different app features in a multi-stage scenario, you can include it in your own web page! 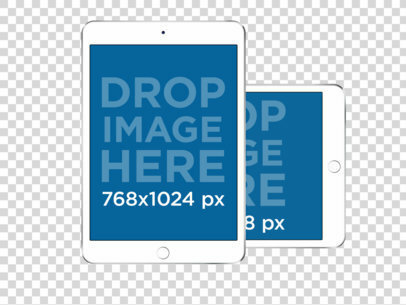 Simply drag and drop your content over the placeholder now and our mockup tool will have your mockup ready in no time. 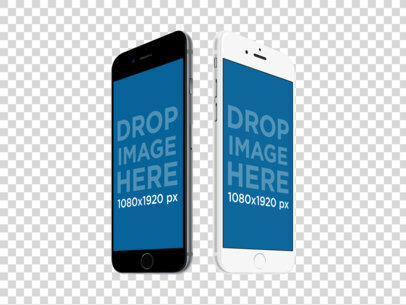 Make your clients fall in love with your latest iOS app in no time with this incredible photo mockup of two iPhones in angled portrait position over a transparent background, all you need to do is add your image over the mockup template and PLaceit will adjust your content in a matter of seconds. 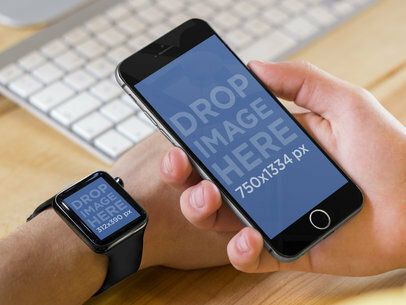 Try out more of our photorealistic digital mockups to build your own app promotion campaign! 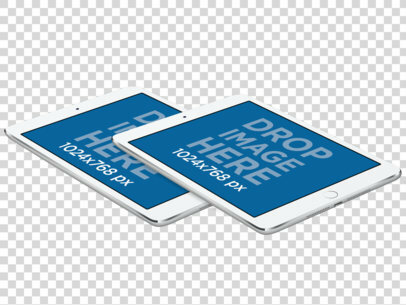 What are you waiting for to try out your new iOS app on this cool mockup featuring two iPad Minis floating in angled landscape position over a transparent background? 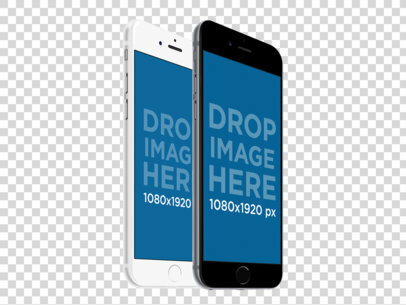 Go ahead and drop your image onto this template, you will have a download ready in seconds! It's very easy to promote your app with Placeit's digital mockups and cheaper! 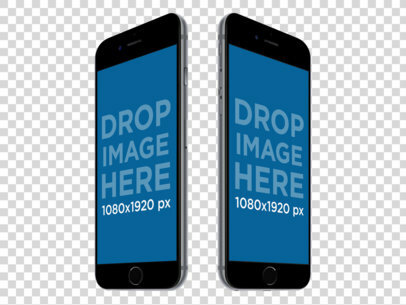 Make your app stand out from the rest with this cool photo mockup featuring a black iPhone and iPhone Plus over a transparent background, cool right? 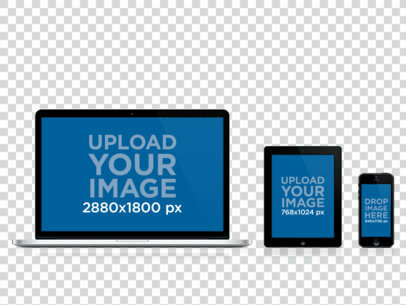 All you need to do is drag and drop your content over the placeholders and our mockup generator will have your download ready in seconds. 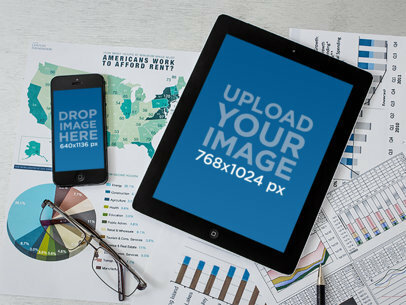 Stop wasting time on Photoshop and start building your campaign with this incredible mockup tool. Check out this great multidevice mockup featuring an iPad, iPhone, iPhone Plus and Android Phone Set over a transparent background in portrait front view position, pretty cool shot right? You can place different images onto the device screens to display the different versions and features of your app! 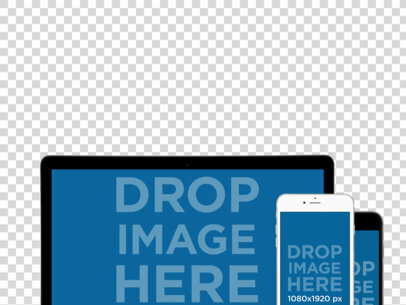 All you need to do is drop an image over the templates and our mockup generator will adjust the content for you in a matter of seconds. 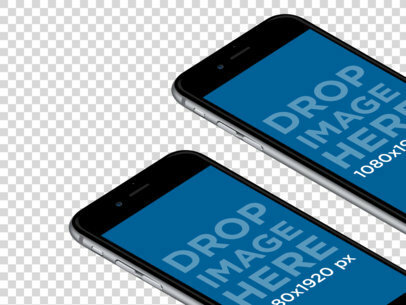 Set your new app on these two iPhone 6 mockups back to back. On the left the black iPhone 6 stands in portrait view and to the right is the white iPhone 6. 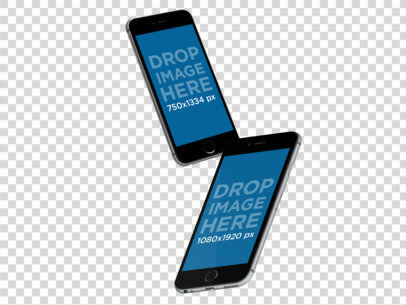 They both hold an image of 750x1344px. They are set on white backdrop and would be the perfect setting for any new app. Are you wanting to show the diversity of your website/app to your audience? If so, Placeit has the perfect mockup for you. This scenario features not one, not two but three different Apple products. An iPhone 6, iPad Mini and a Mac Desktop. Three devices means you can upload three different screenshots from your site. You can use the larger screen of the Mac to display the most detailed screen shot or most important information. Then you still have the iPad Mini's screen, displayed in landscape position for a second screenshot and then you can add yet another screenshot, logo or advertisement to this scene, by placing onto the iPhone 6. Making this mockup a triple marketing threat. A double stage! 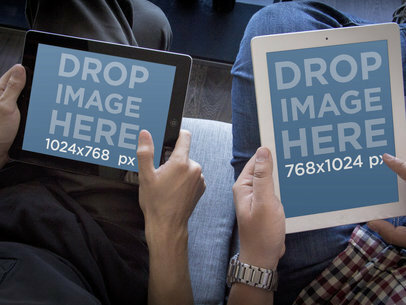 In a top-down view, two men hold iPads. One of them, holds a black one in landscape mode. The other, a white one in portrait mode. 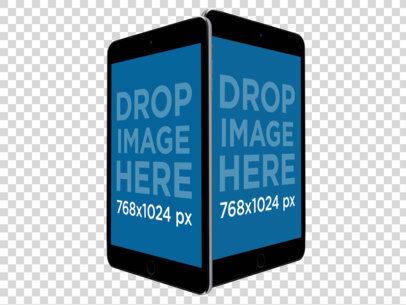 This iPad mockup would fit if you need to compare your app&#8217;s or website&#8217;s modes, or if you want to show two different designs. When developing an app, it is very important to keep in mind that displaying and sharing it is part of the process. That's why choosing to show it off with mockups is one the best app marketing strategies since you will provide an insight on your design and features to potential users. This is a multistage mockup, we can see two of the top selling devices at a creative office environment; a black LG G3 and a Gold iPhone 6 Plus lay over a wooden table displaying your app. This is a particularly useful mockup since you can display your app or website on both Android and iOS for a great exposure. Just upload a screenshot that best describes your app or website on the screens of these amazing devices and see how great it looks. Using mockups surely will improve your app marketing by sharing your product within context, especially if looks as good as this. See more Responsive Mockups here! A teenager wearing glasses looks at his iPhone 6 mockup with your app in while working at his desktop PC with your website of choice in it. This excellent iPhone 6 mockup and desktop PC mockup is designed to compare a mobile version and a desktop version of a design. If you are looking to show these differences, what better than to show it in context? 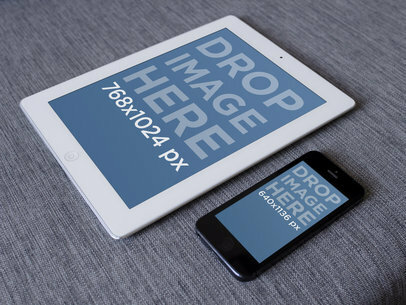 This iPad and iPhone 6 mockup template is a great way to display your new iOS app or website in a clever manner that will draw the attention of your potential clients and users. All you need to do is drop a screenshot straight into the devices and placeit will do all the adjustments for you. Or simply type your URL above and we'll capture an image from there. Try this iPaad mini and iPhone 6 mockup template right away. 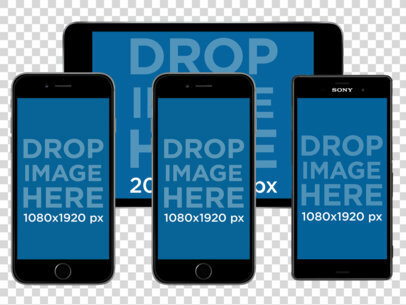 See more Multiple Device Mockups here! This product mockup template is perfect for the multi-platform app focusing on a creative / artistic audience. We see a nice coffee cup filled with a dark coffee, an iPhone, a Moleskin notebook, a mechnical pen and a Macbook air in the photo. All the of the items are laid on top of a bwon table with a light brown finish. 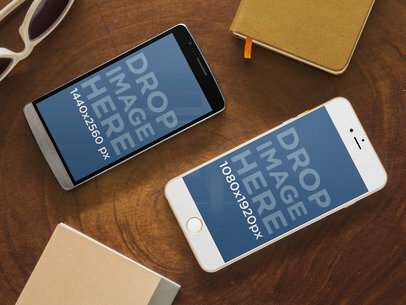 This iPhone mockup template is great for targetting business users. Specifically, this is a great template for those focusing on finance applications. The template features a iPad on a slight angle, an iPhone laid to the left of it and underneath, many different financial projections and papers and a pair of glasses laid on top of a silver table. This is a multi-device shot so it’s great for any type of multi-platform app. 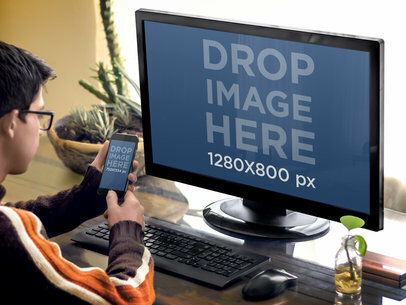 A young creative, wearing and orange-brown sweater, looks at his iPhone 6 mockup, while working on his Desktop PC mockup. The computer is black, with a black keyboard. It lays on a reflective, brown wooden desk. To his sides, he keeps plants that really make this iPhone 6 mockup unique. The black frames of the devices are ideal if you want to showcase two different versions of the same design: the mobile version and desktop version. Double the exposure! Place two different product screenshots in this mockup. Both stages are at a left angle and portrait oriented. This side by side mockup is perfect for different angles of the same product or two completely different products! 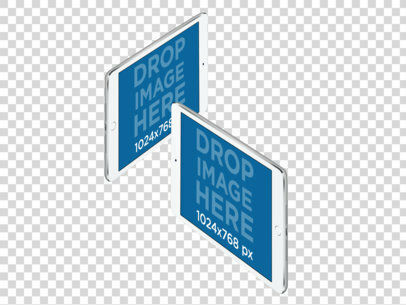 The white iPad is 768 x 1024 px. and the smaller black iPhone is 640 x 1136 px. Both units are lying on a grey tweed couch cushion. The contrast in color between the white iPad and the black iPhone gives this mockup a crisp and concise look. This double stage mockup allows you to place two different angles of the same product or two entirely different products in one image! Apple&#8217;s iPhone 5s Gold on the left is angled slightly more than the larger Samsung Galaxy s4 on the right. They are both lying on top of a textured, grey surface. Stage A is 640 x 1136px, and stage B is 1080 x 1920 px. Both are portrait oriented. You can use this to get a great comparison shot of an iPhone 5s and a Samsung Galaxy side by side tilted slightly towards the left on a dark wooden table. 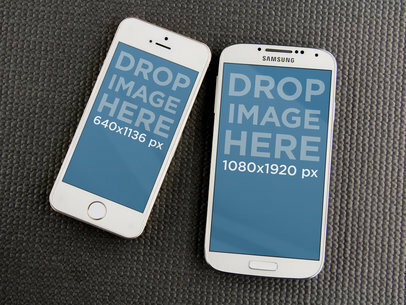 The iPhone 5s will an image of 640 by 1136 pixels and the Galaxy will hold an image of 1080 by 1920 pixels. This is perfect to show your app mockup in two different formats and would work well for just about any sort of app.